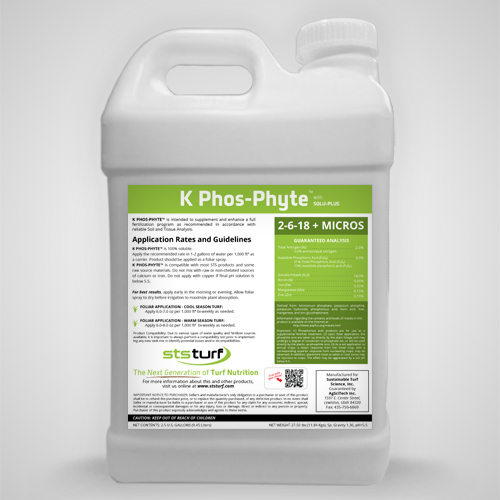 K Phos-Phyte delivers three sources of phosphorus, along with potassium, nitrogen, iron, manganese, zinc and boron. All of these components are complexed and chelated with amino, humic and fulvic acids. Our proprietary bio-surfactant and plant health package is added to reduce surface tension, enhance foliar absorption and optimize the “Systemic Acquired Response”. The high potassium constituent of this product assists with photosynthesis, metabolizing carbohydrates for the manufacture of amino acids and proteins, improves drought and wear tolerance, as well as, stress resistance. Excellent source of available phosphate (PO4) to ensure energy transfer and extensive metabolic functions, while also delivering phosphorous acid (H3PO3) to undergo a degree of conversion to a phosphate ion. K Phos-Phyte also has available phosphite (PO3) to trigger plant defense mechanisms.